I want to take a quick break for a second to talk about something creators go through but often don’t talk about. It is hard to see it coming and even harder still to lift yourself out of once you are there. This post is about addressing creative burnout. Many of you use webcomics as a way to let out some creative steam; a way to get your ideas down on paper with the added encouragement that comes from an active and supportive community. You are enthusiastic, excited and the thought of continuing the project gets you out of bed in the morning. Then maybe further down the line, you have a bad day or even a bad week. You miss an update. No biggie though. You’ll get back into that groove next week! But you don’t. It becomes harder to come up with ideas and life is at your ankles tugging you away, draining your energy and then comments and views have suddenly dropped off. You’re finding it harder to put time into your work because who cares right? No one is reading it. No one cares as much as you do and why would they? It was a bad idea to begin with. You post a message saying you’re on a definite hiatus or worse, you let your story fade away. As a creative, you often feel that you cannot be honest that your project is taxing you. When putting your best self forward is held to be the key to any appearance online it is hard being honest with those you interact with let alone yourself. But as with any recovery process, the first step is realising that it is a reality and that it is happening to you. If you feel you need to talk, you can post here on the forums, or talk to fellow creatives about it. You might be surprised how many have experienced the same thing. Another point to consider is that creativity is often considered an elusive gift. It is there one day and then gone the next. Well, that is not exactly true. In her blog post on the subject, Natalie Sejean explains that creativity is a muscle and burnout is the injury. Treat yourself with kindness. Rest, meditate, try and eat healthily (as hard as that is) and most important of all, give yourself time from your project. Give yourself a mental holiday to refresh your brain. This might mean giving yourself the time to sort out those pressing life issues or merely playing that video game you’ve been meaning to finish. The next step is to introduce fluidity and variety into your creative process. In the age of information, where every piece of content must have meaning, it often adds that layer of burden to your process. You can’t make mistakes. You can’t experiment. You can’t do something for the hell of it. You know what? Don’t feel that you have to only expose yourself to webcomics. 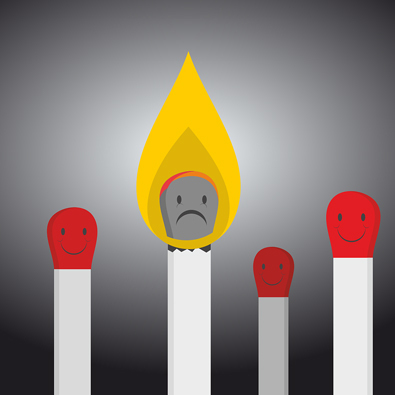 Oversaturation can lead to a burnout as you are not exercising your mind muscle. Do other projects for a bit and learn new skills along the way. Try different mediums, expose yourself to different topics of interest. Be curious. Often, this gives you inspiration and motivation to go back and continue your work. Being creative is double-edged sword but it is one none of us would want to relinquish. And remember we are here for you. Next week we’ll be back to our regularly scheduled program. very good advice. admittedly if it wasn't fro the fact gns drives me, it would be hard to invest in it. i actually make more money writing than i do for gns. back when my day job allowed me time to work it, churning out five pages a week was no chore, now i spend a lot of time rushing to keep up with two. I experienced burnout some time ago. Something horrible happened and I didn't know if I could stay in the comic book industry because the family financial problems and family health issues (and going to the public service, for some stability). At that moment, I realized I'd do comics no matter what my day job would be or how I should do to survive. I've never had a burnout with my own project again, ever. I discovered I did it for me, until I die, even if I have to draw it with a burned match in a toilet paper XD So every single moment I can sit and draw/write my project, I feel an immense gratitude for this chance. I feel inspired, because I don't know when I will have to give up on my career to support my family. My project heals me, not kills me. I'm hitting the wall for the second time. the creative process is such an output. I feel like I need some input for a while. I know the story, I just feel like I'm out of jokes. How did those Newspaper guys do it? churn out six strips a week? Good Grief. I recently experienced my first burnout!! The Illustrated Novel I was doing here, I just felt a drain... I'm still processing what happened cuz it felt so alien!!! I will certainly take some of this advice to avoid that happening again! Great article Emma! My worst burnouts always come at the end of a chapter/story when all the exciting pages are over and it really just requires summing up and leaving tidy. Each page towards the final one feels like walking up a muddy hill in lead boots and it's only because I feel I'd be letting readers down that I struggle to the end. But one must take a break when it's needed or else it takes all the fun out of doing it at all. The whole theory of how a webcomic is supposed to work seems to be set up for burnout! You create a story designed to gradually build an audience through regular updates and by definition, you have to keep the same thing going ad infinitum in order to do that. But how many authors would want to keep on writing the same book indefinitely? In the words of Bacharach and David - "Make it easy on yourself, make it easy on yourself, 'cos breakin' up is so very hard to do, oh baby, it's so hard to do, so make it easy on yourself".